Image from the film Home Front: During World War II - Co-produced by Connecticut Public Television and Connecticut Humanities as part of the Connecticut Experience series on CPTV. – Co-produced by Connecticut Public Television and Connecticut Humanities as part of the Connecticut Experience series on CPTV. This clip from Home Front: During World War II explores Connecticut’s reaction to Germany’s renewed threat to the European continent in the wake of World War I. While Connecticut’s factories stood ready for a call to arms, the memories of the previous war’s destruction and loss divided the state. 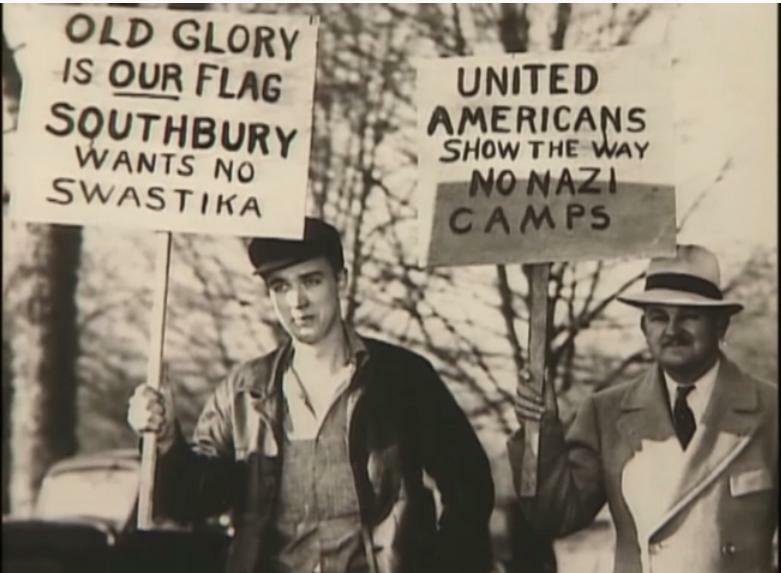 From peace movements to an unexpected political battle in Southbury between the pro-Nazi German-American Bund and their opponents, this video provides a brief glimpse of Connecticut in the years leading up to the outbreak of World War II.